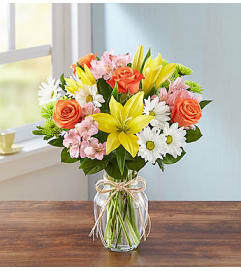 Tiny Miracle New Baby Girl Bouquet is the perfect way to send your happy wishes to the new family! 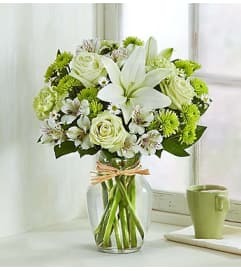 Blooming with blushing pink blooms to welcome the little princess into the world, this gorgeous flower bouquet brings together pink roses, pink Asiatic Lilies, pink carnations, pink mini carnations, white traditional daisies, and lush greens to create a memorable gift. 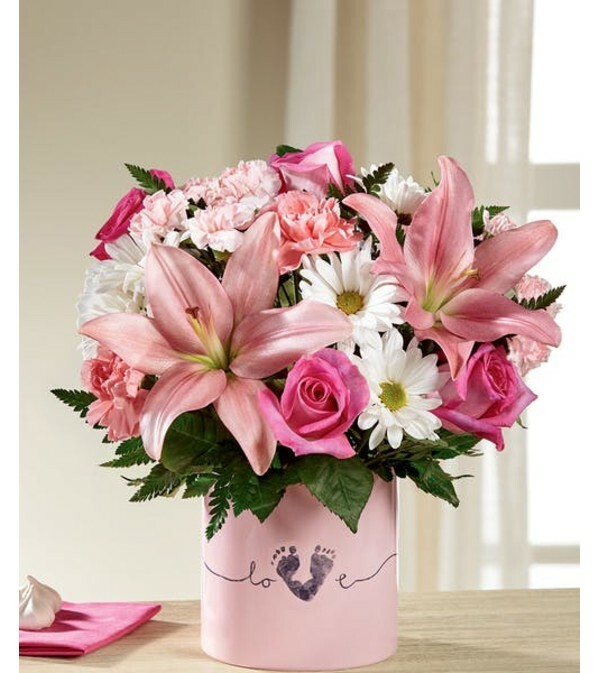 Presented in a keepsake pink ceramic vase with "Love" written in a script font on the front, and the print of a baby's foot making up the 'V' in the word for a sweet and touching affect, this fresh flower arrangement is a wonderful way to send your congratulations to friends and family at this joyful time in their lives.